Over the years on the internet I’ve encountered the subject of an ancient Egyptian glazed plaque supposedly mentioning the “Anu People.” You will see this plaque featured on some web pages, including this one, and usually in historically revisionist form. It is particularly popular among the afrocentric set of historical revisionists. These folks are of proud African descent and in their zeal they try to present ancient Egypt as a homogeneous, unwavering race of black Africans. In the other extreme are eurocentrists who try to paint the founders of the great civilization of ancient Egypt as European in origin. Both are wrong. Professional research and scientific inquiry have demonstrated to us that, not surprisingly, the original population of the Nile Valley was a lot more complex than that. It is extremely rare in the analysis of ancient history for us to find a topic so black and white, so to speak. 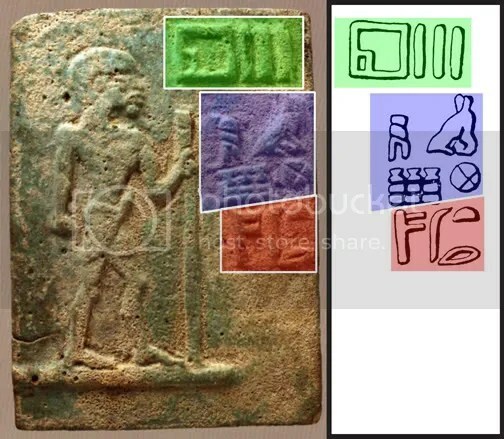 Ancient history was not produced by a cookie-cutter pattern. It is our own failing that many of us bring modern racial baggage to historical debates, which is something that would be certain to confuse an ancient person. Taking ancient Egypt as an example, there is really nothing in the historical record of the ancient Nile Valley that would lead us to suspect the Egyptians thought in rigid racial terms. Indeed, ancient Egyptians were like so many other neighboring civilizations: as long as you belonged to the group, you were fine; if you belonged to another group, you were inherently inferior. Xenophobia was the rule, not racism. Skin color was not necessarily a factor. Recently there was an exhibition called “Visible Language” at the Oriental Institute Museum, in Chicago. This plaque is in the collection of the O.I. (OIM E7911) and was one of the artifacts on display in the exhibition. As a docent, when I gaze at this relic what I appreciate is its great antiquity–coming as it does from the very dawn of the Egyptian kingdom. Unfortunately I am also reminded of how it’s treated on the internet. A person’s skin color is irrelevant to me, but what rankles me is when a bit of history, even this small and unassuming glazed plaque, is twisted to suit a modern socio-political agenda. The above translation from the web page is wrong on all counts, although the name of the individual in the figure standing at left comes close. His name (shaded in red) is transliterated as tri-nTr. It can be rendered as Terinetjer (as one example) and can be translated as “One who worships the gods.” This is his name, not a title. The translation of the glyphs I’ve shaded green are still the subject of dispute but the current transliteration is nxn.w (MacArthur 2010: 136), which can be rendered as Nekhenw. It is believed that this is the name of an estate of which Terinetjer may have been in charge (ibid); more on that presently. 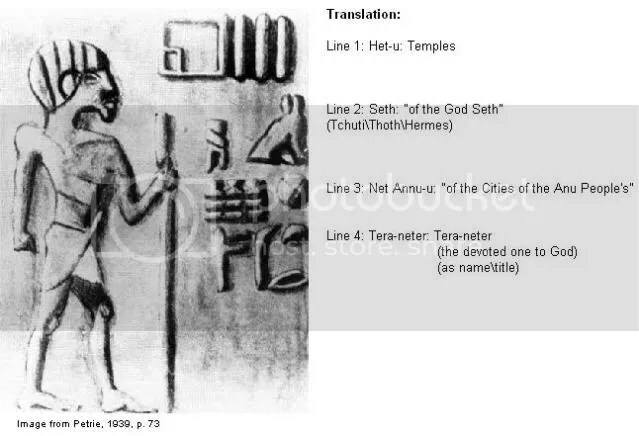 The translation from the web page breaks the next set of glyphs into two lines: “of the god Seth / Net Annu-u: ‘of the Cities of the Annu People’s. '” This is incorrect. In my own image this is the area I’ve color-coded blue, and it’s simply a cadrat or square of glyphs all of which belong together when read. The correct translation is Menhet (transliterated mnH[.t]), and is the name of a town. It’s location is not known today but it was probably the nearest settlement of size to the estate called nxn.w (Nekhenw). The Aunu People. Besides these types, belonging to the north and east, There [sic] is the aboriginal race of the Anu, or Aunu, people (written with three pillars), who became a part of the historic inhabitants. The subject ramifies too doubtfully if we include all single-pillar names, but looking for the Aunu, written with the three pillars, we find that they occupied Southern Egypt and Nubia, and the name is also applied in Sinai and Libya (Petrie 1939: 68). This information about the Anu and the pillars is incorrect and is not linguistically supported in the hieroglyphic script in this instance. It must be understood that in this early time the understanding of hieroglyphs was leaps and bound behind what we know today; moreover, Petrie himself was the first to admit his own acumen with hieroglyphs was quite limited. He never delved into comprehending the script as he did with other things historical, and his achievements as the “founder of Egyptology” lay in other matters altogether, particularly in stratigraphy and other dating methods and archaeological techniques. Perhaps some of you are wondering where I’m going with this. I opened with a caution against revisionist tendencies like afrocentrism and eurocentrism, and Terinetjer’s plaque has fallen into this sphere. For one thing, afrocentric websites point at the negroid appearance of Terinetjer, and they turn to Petrie’s own descriptions in The Making of Egypt (in which Petrie notes physical characteristics of Terinetjer together with human remains he had excavated at Tarkhan [ibid]). Terinetjer may or may not appear as what we might think of as a black African. As any well-trained student of ancient Egyptian art history can tell you, deducing racial types from pharaonic art is often fruitless (albeit not always). The way Terinetjer appears on the plaque may be nothing more than a stylistic preference or a lack of skill, for that matter. The point is, when one understands an artifact such as Terinetjer’s, one knows that depicting the race of the individual was irrelevant. Preserving that individual’s name and titles is what mattered to the ancient mind. This is why Terinetjer is presented with the probable name of an estate he served, nearest the town where it was located. The plaque was found in a funerary context in Abydos, one of the most ancient cemeteries of Egypt and the first royal cemetery. It was recovered in one of Petrie’s excavations there. The web page mentions that the glazed plaque is predynastic, but it is not. It is dated to Dynasty 1 (MacArthur 2010: 136). Egypt had become a kingdom, and Terinetjer served a king of Dynasty 1. A myriad of estates grew produce and prepared other goods for the funerals of kings, and the names of these estates are preserved on many tags and plaques from this period. Plaques like Terinetjer’s reflect the prestige of belonging to the central administration and contributing to the funerary economy (Stauder 2010: 144-45). This is what Terinetjer’s plaque is about. It is well understood that the kingdom of Egypt grew from tribal societies scattered throughout the Nile Valley. Something of this tribal origin is preserved in the complex and varied religion of pharaonic Egypt, but identifiable socio-political traits of the original tribes quickly disappeared once state formation was achieved. Henceforth, the king and nobles and other elites presented themselves not as members of this or that tribe but as the ruling class of the kingdom. This is to stress the fact that no group of Egyptians, to my knowledge, ever called themselves the “Anu People.” Such a claim is a fallacy based around a bungled translation. There is a sad irony in the afrocentric promotion of Terinetjer’s plaque. The web page quotes a number of statements from Petrie’s 1939 publication, probably due to the assumption that as the founder of Egyptology Flinders Petrie is a solid source to use. In most ways he is, but the fact is, Flinders Petrie was one of numerous scholars in the early days of Egyptology who believed the kingdom of Egypt was founded not by the population of the Nile Valley but by a “dynastic race” that came in from the outside (Drower 1995: 181, 213, 217). Bearing colonial attitudes, Europeans of the day had a hard time fathoming that Africans could have created such a remarkable, powerful, and long-lasting kingdom. More current archaeology and research has settled this issue. Dynastic Egypt was founded by the Egyptians themselves. Peoples moved from the south into the Nile Valley, from the western deserts, from the eastern deserts, and from the northeast. From the beginning, the population of the Nile Valley was racially and ethnically mixed. To me, personally, this had to have been one of the strengths of the kingdom of Egypt. In the words of Toby Wilkinson, one of the leading researchers of prehistoric and Early Dynastic Egypt: “…at its most fundamental, pharaonic civilization is an Egyptian, indeed an African phenomenon” (ibid). When it comes to studying ancient Egypt or any other ancient civilization, it behooves us to dispense with our modern racial baggage. We must approach the ancient civilization on its own terms: how its own people thought and felt, not how we think and feel. As difficult as this can be for many modern people to do, it is essential to do so. With ancient Egypt in particular, what most matters is what this great civilization accomplished in the course of more than 3,000 years. What color their skin was is irrelevant. I’m quite certain Terinetjer would agree.